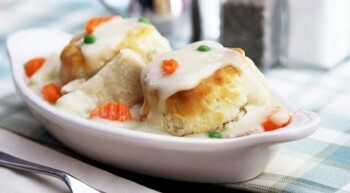 Vanee Chicken & Dumplings are tender southern style, square, flat dumplings simmered in a subtle chicken broth. 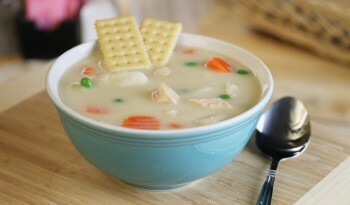 Use in chicken & dumplings applications, soups, pot pies, or serve over biscuits. 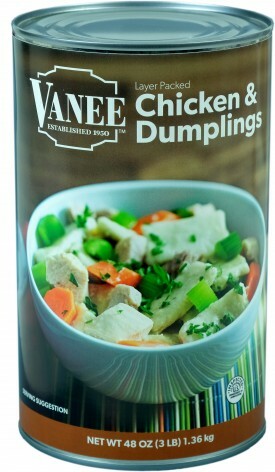 Vanee Chicken & Dumplings have less sodium than other brands, and their shelf stable, ready-to-use simplicity saves labor and means you get consistent results every time. Each 48 oz. can has 6 one-cup servings, for a total of 72 servings per case. 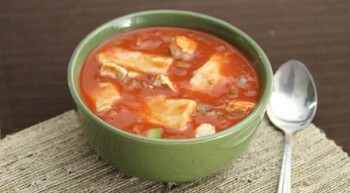 Chicken Broth, Water, Cooked Chicken Meat, Enriched Semolina Flour, Durum Flour and Wheat Flour (Malted Barley Flour, Niacin, Ferrous Sulfate, Thiamine Mononitrate, Riboflavin, Folic Acid), Chicken Fat, Salt, Palm Oil, Monoglyceride, Food Starch - Modified, Eggs, Flavorings, Leavening (Sodium Acid Pyrophosphate, Sodium Bicarbonate, Corn Starch, Monocalcium Phosphate), Onion Powder, Disodium Inosinate, Disodium Guanylate, Natural Coloring and Flavoring.